This is a transcript of SYS Podcast Episode 253: Writer/Director Jermey Unger Talks About His New Indy Thriller, Ride, Starring Bella Thorne. Ashley: Welcome to Episode #253 of the Selling Your Screenplay Podcast. I’m Ashley Scott Meyers, screenwriter and blogger of the www.sellingyourscreenplay.com. Today I’m interviewing writer-director Jeremy Ungar who just did a film called Ride, kind of a cool drama thriller about one night with an Uber driver. We talk about his background and how he got this film produced, so stay tuned for that interview. If you find this episode viable please help me out by giving me a review in iTunes or leaving me a comment on YouTube or retweeting the podcast on Twitter or liking or sharing it on Facebook. These social media shares really do help spread word about the podcast so they’re very much appreciated. Any websites or links that I mention in the podcast can be found on my blog in the show notes. I also publish a transcript with every episode incase you’d rather read the show or look at something later on. You can find all the podcast show notes at www.sellingyourscreenplay.com/podcast, and then just look for Episode Number #253. 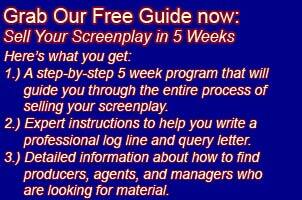 If you want my free guide- How to Sell a Screenplay in Five Weeks you can pick that up by going to www.sellingyourscreenplay.com/guide. It’s completely free, you just put in your email address and I’ll send you a new lesson once per week for five weeks along with a bunch of bonus lessons. So now let’s get into the main segment. Today I am interviewing writer-director Jeremy Ungar. Here is the interview. Ashley: Welcome Jeremy to the Selling Your Screenplay Podcast. I really appreciate you coming on the show with me today. Jeremy: Hey, thank you so much for having me Ashley. Ashley: So to start out, maybe you can tell us a little bit about your background. Just quickly, where did you grow up and how did you get interested in the entertainment business? Jeremy: So I grew up in Los Angeles so movies and the entertainment industry were kind of omnipresent in my childhood. From the time I was super young I knew that I wanted to direct movies. I grew up watching movies, I always fantasized about what a movie that I would make would be like and then in my kind of teenage years I got really into theater. So my background as a director is actually kind of centered around theater directing. I went to school for theater directing and in doing my first feature I wanted to make something that could almost feel like a play but also really be communicaly cinematic. Ashley: Yeah. So let’s dig into your latest film Ride starring Bella Thorne. Maybe to start out you can give us a quick pitch or a logline. What is this film all about? Jeremy: Ride is a thriller and it’s centered in the course of one night all in Los Angeles and all in an Uber. The movie takes place in the course of two separate Uber rides and the main character is an Uber driver. He picks up two passengers, one who’s a pretty normal person and another who is like a very charming sociopath. It aims to kind of deal with the trust that technology has kind of gotten us to place in people which can sometimes result in really amazing encounters and sometimes result in us making ourselves vulnerable in ways that maybe we shouldn’t. Ashley: Yeah. So what was the genesis of this project? You mentioned that you have a background in theater so you wanted to make something that almost felt like a stage play in some regards. But what was sort of the genesis of this idea? Jeremy: Yeah, I’ve always loved contained movies I think partially because of the theater thing and also partially because I think it’s a really unique challenge to try to deal with something where you’re in this tight space and make it feel visually varied and feel cinematic. And so I knew for my first feature I wanted to write something contained. I also wanted to write something that was really dialogue driven. I thought a lot about what kind of pressure cooker encounters exist and are relevant in our society right now. I wrote this script in early 2015, and recently when I’ve been thinking about how to talk about it I went back into my Uber App and I looked at when I took my first Uber ride and it was January of 2014. It’s so interesting to me that in like just a year that interaction had become from something totally foreign where it’s like alright, there’s this App and I get into a stranger’s car, it’s just something that I did on a really regular basis enough to wanna write a script about it. Ashley: Yeah. I’m curious and you just mentioned you wanted to give it a cinematic flair. As I heard about this film I thought, “Oh, it’s gonna feel very stagnant all in the car.” You did a great job of getting a lot of coverage of all the talking in the car. Did some of the short films you did, did you shoot in some cars in some of the short films? How did you get a background into just understanding how to shoot these scenes that were in the car? Jeremy: Well, first of all thank you for that and second of all, after I wrote the script for Ride I directed a shot that was really a proof of concept piece. I took maybe the first 40 pages of the script and condensed them to a 15 minute shot, principally for the purpose of proving that I could make this feature. But then also it really served as a great testing ground of learning how to do this type of stuff. We shot one kind of half a night for the shot on a process trailer, which is this flatbed truck that the car is strapped to and then you have your cameras mounted in two positions and you drive around on a loop basically and run the scene over and over again and then move the cameras and get all the angles that you want. That was really instrumental in me learning both how to shoot this thing and how to handle car stuff and also how to cut it because it’s a tricky dance cutting this kind of footage because you have the two cameras so you can be very free within those two, within that kind of consistent take. But then once you want a cut you really have to make sure the car is moving at the same speed in the other shot. So there’s a really interesting dance that you do with this type of footage. Ashley: Yeah, for sure. So let’s talk about your writing process a little bit. How long did it take you to write this script? Maybe you can even go into what your writing process looks like. How long do you spend outlining the script, how long do you spend actually in final draft cranking out script pages? Jeremy: Yeah, so I did an outline I figure it would have been December of late 2014, and [inaudible 00:06:33] thing that I was working on and some of this dialogue came out of me and I got really attached to the voice that I found for the sociopath. Then I had an outline fairly quickly, probably in a week or two and then I sat down and kind of in two sleepless days wrote I guess probably a 75 paged first draft of the movie. But that’s like not really representative of how fast…I probably wrote that draft then refined it for another month or two then did the shots. After doing the shots still I was sending that to people and trying to get traction. I was constantly revising the script probably up until we shot which was late 2016 and then a tiny bit nearly 2017. Ashley: Yeah, and so let’s talk about that development process. After you spent a few months developing this yourself, what does that development process look like for you? Do you have some trusted writer friends you give it to, some producers that you know? Who do you give it to and then how do you interpret note at that first early stage? And then also it’s a really nice opportunity to get feedback from everyone at the table about what worked, what didn’t, what was confusing, what wasn’t, all that sort of stuff. And then also this process was such a kind of learning curve for me because it was the first feature that I’ve directed. But I feel like I also sort of had to learn how to interpret notes that in some cases I feel like a note will be something that is a matter of opinion and the person believes that my sensibilities might differ. And then in other cases you’ll get the same note five or six times and you realize like, well even if they’re saying a different thing and it’s all falling in this place, this is something I really should address. Ashley: Yeah. So how did you approach screenplay structure or certain genre requirements? This is kind of a thriller…how did you go into this especially something like this that maybe because it’s two nights and a lot of it’s in the car it’s maybe not quite as formulaic as some films. But just maybe talk about that a little bit. What was sort of the screenplay structure and the genre requirements that maybe you were thinking about as you were writing this? Jeremy: Sure. I really wanted to specifically structure this movie the way a night out in Los Angeles is structured. So there were certain key bits that I feel like people do when they go out at night that I had to hit. It ranges from the moment where you’re waiting in front of the bar to the moment where after you leave you stop for cheese burgers. In every one I tried to kind of turn it on its head but I wanted to make sure you have the feeling of the structure of the movie is the structure of a great night out with your friends. That was like one key point for me. And then another…it’s a little bit of an odd structure that I landed with and a movie that was really influential on me because I feel like it was turn really half way through the movie. Another film that does that is this French movie called He Loves Me He Loves Me Not that was Audrey Tautou in the early 2000s. It’s this incredible movie because the first half of it really feels like a romantic comedy and it feels like it was marketed in that way and it has Audrey Tautou and you think it’s this you know what this French romantic comedy is gonna be. And then halfway through the film you realize that the male protagonist and Audrey Tautou actually don’t know each other and she’s a stalker, and it takes this very dark twist. I so loved how the film turned all your expectations on its head. That was something that I think was influential on how I structured Ride. Ashley: Yeah. So let’s just talk quickly about how you actually got this produced. So you’re done with the script, you’ve done some reading with actors, you’ve done some development. What were those next steps to actually get it to producers and actually get the money to shoot this? Jeremy: So I felt that for me as a first time feature director to be considered I would need a shot to prove that I could do it. So I approached this commercial production company that I had worked with, that I actually started working them as a PA when I first finished college. I brought this script to them and we partnered and decided to make a shot using a lot of favors, a lot of resources that the two of us could pull together. Once that existed I had the script, I had a short proven concept and then I also made this back that was probably 30 pages visual reference and a director statement and things that really I thought alongside the shot could kind of articulate what my vision would be for this bigger feature. And then based on those I started taking meetings with production companies and the company I landed with was a company called Unified Pictures and it was one of these interesting things where…you know in the Ride script there’s a lot of stuff that I felt like once money gets involves there’s no way I’m gonna be able to have a Shakespeare monologue in the movie or like I was not gonna have a jazz standard beat being sang in the car for two minutes. I got really lucky that my producers were super [inaudible 00:12:13] about all of the kind of more risky creative choices that I wanted to make and so it worked out well. Ashley: How did you get those meetings with these various production companies? Jeremy: The initial thing for me was submitting my package of scripts to agents…the script that [inaudible 00:12:33]. The initial thing was agents and then once I got agents on board I had a handful, I think it was actually three meetings with production companies and Unified were the ones that initially responded to it. I really liked those guys and thought they were great. And then there was also an odd thing that happened where we had our meeting and they gave me some notes and I asked to give them in a few weeks passed and then two Uber films got announced on deadline. They were both action comedies and I don’t think another one has been made but it happened before they had officially signed on to the project so I felt like I’m dead in the water, like this is it. But we got on the phone and we talked about it and we felt like okay, we can be nimble and run independent film and we can be first and they weren’t deterred and we did. Ashley: Yeah. How can people see Ride, do you know what the release schedule is gonna be like? Jeremy: Yes, so we’re gonna be released on October 5th and we come out in 10 cities across the US, and then also we’re gonna have a VOD release, so [inaudible 00:13:34]. Ashley: Perfect. And what’s the best way for people to keep up with what you’re doing, Twitter, Facebook, anything you’re comfortable sharing I’ll round up for the show notes. Jeremy: Yeah, my Twitter is very inactive but all of my social media handles are just my name, it’s Jeremy Ungar, and that’s J-E-R-E-M-Y U-N-G-A-R. I post most on Instagram. Ashley: Okay, perfect. I will grab all that stuff for the show notes. Jeremy, I really appreciate you taking some time out of your day to talk with me. Excellent job on this film and I wish you luck with it. Jeremy: Hey, it was a real pleasure. Thank you so much for having me. On the next episode of the podcast I’m gonna be interviewing South African screenwriter Sean Drummond who just did a South African western called Five Fingers of Marseilles. The film was written for the South African market, the film was also shot in South Africa, but it was heavily influenced by the American western film. It’s a fascinating look at a non-USA filmmaker and how he and his team were able to get this film produced. As with a lot of the filmmakers who come on this podcast it took many years and a lot of effort to bring it all to fruition, so keep an eye out for that episode next week. That’s the show, thank you for listening.